Alongside its partners, the University of Kent — including the expertise of a group from Roma Tor Vergata around the embedding of skills transfer in skin-mounted biosensing technology — and the University of Manchester, CPI is providing the project with its manufacturing knowledge and expertise across the Internet of Things, R2R integration and battery formulation. In particular, CPI will be looking at bio-degradable material selection. The project aims to allow communication at distances greater than passive alternatives and enable monitoring on objects or on skin, for example in atmospheric vapour sensing or medical testing. Integrated battery assistance will also make possible many potential applications, including bio-sensing, pharmaceutical patient compliance, and temperature and power monitoring. Successful outcomes will provide unprecedented data from attach-and-forget smart labels that are customised by overprinting with different sensing films. 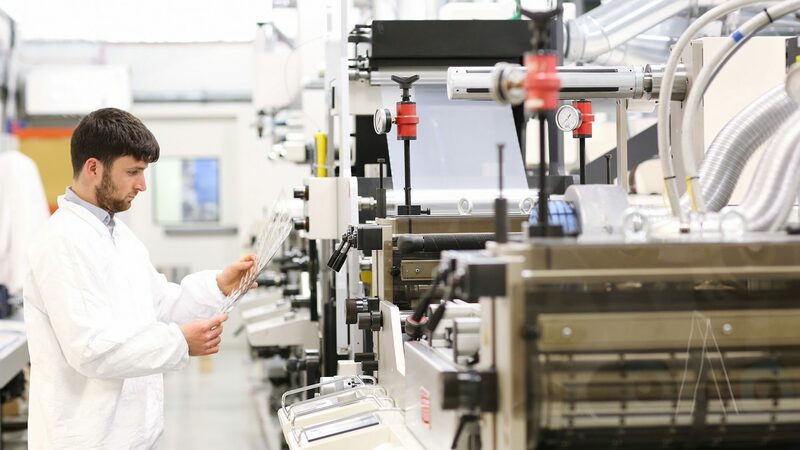 The team of leading wireless, battery formulation and digital manufacturing researchers will combine with CPI’s state-of-the-art printed electronics and formulation facilities to enable this novel technology. Professor John Batchelor, from the University of Kent’s School of Engineering and Digital Arts, said: ​“The BatterySense project has huge potential to transform multiple industries by allowing us to create skin-mounted wireless data transfers that are non-invasive and sustainable.